Cells are flown through the microchannel by air pressure. Individual cells are analyzed at the laser interrogation point. Up to here is not any different to a conventional flow cytometry system. 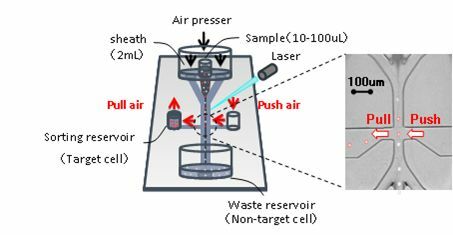 The novel sorting method involves gentle but rapid generation of liquid pulses at the sorting junction that pushes only the target cells into the collection chamber. All the other cells would pass through the sorting junction to the waste reservoir.